Bayenah moved to Canada from Jeddah, the fashion capital of Saudi Arabia. From her cultural background to traveling, she finds inspiration everywhere she goes. 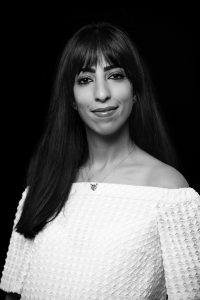 Being surrounded by different fabrics, textures and colour in Jeddah inspired her to pursue a career as a Fashion Designer. The first garment she designed was her sisters wedding dress. In March 2016, she won third place in Western Canada Fashion Week’s Emerging Designers Competition for her embroidered, faux fur and shearling coat. Her collection, “Naseej” includes garments with ornate embroidery and bright tropical colours. Early inspiration for the collection came from a recent trip to the Chihuly Exhibit in Seattle.